Auto-magically prepare your 3D models for 3D printing. 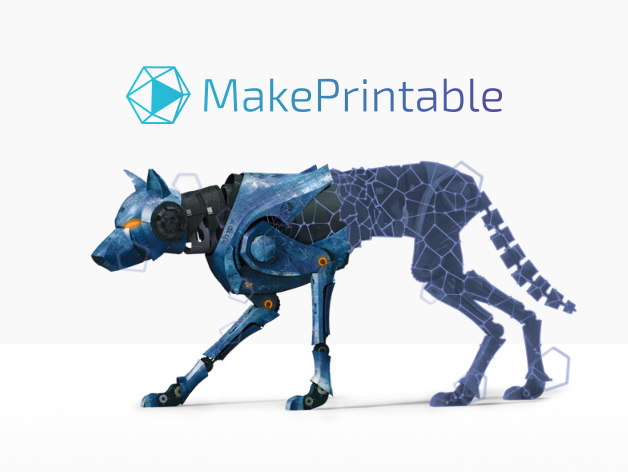 A cloud based 3D models Preparing and Healing solution for 3D Printing, MakePrintable provides features for model repairing, wall thickness, STL conversion and integration with multiple design softwares, MarketPlaces and 3D Printing Services. Then click Repair on the Thing you would like to Analyze and Repair. If its green its printable, but we still recommend fixing it to double check. If it's yellow, you can see what's wrong with it in the summary box on the right. You can scale, orient and rotate using the GUI. For best outcome always orient your model vertically. You will see your thing "Repaired" with the new summary on the right-hand side. Again if its green its ready for printing, if it's yellow, it's still not ready for printing. You can compare to original and have a refix feature. Refix only if your not happy with the outcome and would like to try a different orientation. If you are the original owner of the Thing. You will have the ability to save over the file. You can always choose to remix it as another rendition of the original Thing. If you are repairing someone else thing, you will only have the remix option. We're sure MixedDimensions would love a Tip, but unfortunately they have not setup their accounts to receive them yet.